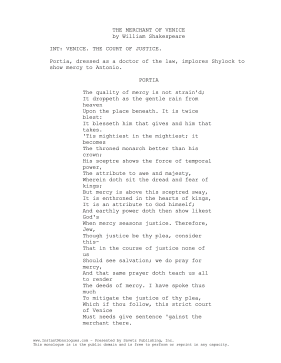 Portia, in disguise as a male lawyer, performs this 1-2 minute monologue from William Shakespeare's play, The Merchant of Venice. INT: VENICE. THE COURT OF JUSTICE. Portia, dressed as a doctor of the law, implores Shylock to show mercy to Antonio.